Seife ist ein faszinierendes Material weil es durch Handarbeit hergestellt werden kann; Seife machen enthält eine fast magische chemische Reaktion; das Produkt in sich scheint mir durch seine Textur, das Schmelzen und Verschwinden auch sehr bedeutungsvoll. 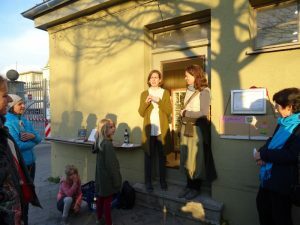 Mit Seife habe ich schon in anderen Kunstprojekten gearbeitet: in “The soap project”, 2005 war die Seife ein Medium, um mit dem Publikum eine persönliche Beziehung einzugehen; “Culo blanco”, 2016 war eine Performance mit Wäsche und Seife in der es um Erinnerungen aus meiner Kindheit ging. Riesgo de caída (oder “Vorsicht rutschig”) weist auf die Idee hin, dass man als Mensch (und besonders als Frau) in der Gesellschaft immer dem Risiko unterliegt, auszurutschen oder hinzufallen. Wobei das wieder Aufstehen, den Faden wieder aufzunehmen, ein langer, rutschiger und mühsamer Weg sein kann. Tausend Mal gesagt aber vielleicht noch nicht richtig erkannt: eine männlich strukturierte Gesellschaft wird nie die Bedürfnisse von Frauen angemessen erfüllen können. Soap is a fascinating material because it can be made by hand. Soap-making involves an almost magical chemical reaction. The product in itself seems to me very meaningful due to its texture, melting and disappearance. I have worked with soap in other art projects: in “The soap project”, in 2005 used soap as a medium to enter into a personal relationship with the audience; and “Culo blanco”, in 2016, was a performance with laundry and soap about my childhood memories. 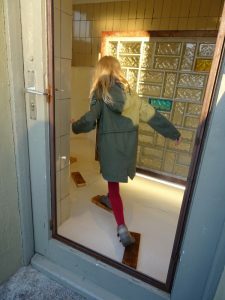 This time, I am interested in soap as a building material for my installation: I will create a floor on the floor of the KloHäuschen. A slippery floor. 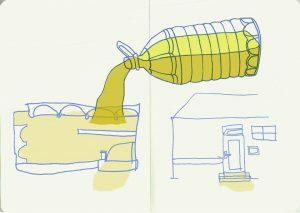 I will collect old olive oil, mostly from friends living in Munich, which I will mix, warm and shake for a few days on site, almost like a construction worker. At the end of my collaboration with the toilet, the soap will be broken and distributed, used and disappeared. Riesgo de caída (or “caution, slippery”) points to the idea that as a person (and especially as a woman) in society, you are always at risk of slipping or falling. But getting up again, picking up the thread, can be a long, slippery and tedious way. A thousand times said but perhaps not yet correctly recognized: a male-structured society will never adequately meet the needs of women. Alba Navas Salmerón, born 1975 in Seville, Spain, studied fine arts and painting in her native city. She had an Erasmus scholarship at the HdK in Berlin, followed by a master’s degree in Public Art at the Bauhaus University in Weimar. From 2004 to 2008, she mainly dealt with art projects in public space. Then she returned to the studio. Color, composition and the human being as being and spectator have characterised her work from the beginning. These themes are not only dealt with in painting, but shape her projects in public. Humor in connection with criticism is also often included. 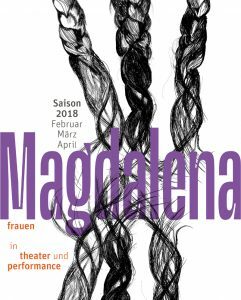 She lives in Munich since 2010 and runs a screen printing workshop in the Leonrod Haus für Kunst, where she also paints, draws and designs new projects.